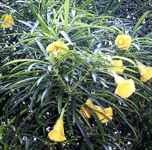 Evergreen shrub or small tree with saffron yellow blooms - fragrant as well as beautiful - and long narrow leaves. Suitable for warmer climates and greenhouses, it prefers a rich moist well drained soil. Hardy to 40F (4.4C); height: 25ft.